Christian Media in Nigeria : Frank Edwards, Asu Ekiye, Chidinma and Buchi To Open COSON Week! 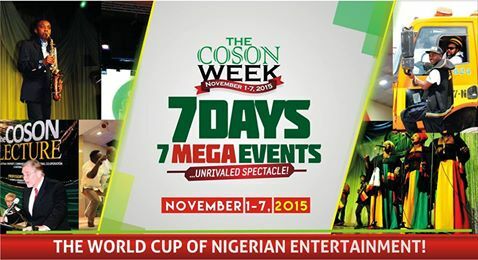 Frank Edwards, Asu Ekiye, Chidinma and Buchi To Open COSON Week! The much talked about 2015 COSON Week is finally here. The 7 days of explosive events over 7 venues in Lagos will begin this Sunday, November 1, with 'COSON in the Church' - the big national day of prayer and invocation to the Almighty which will hold at the KICC Prayer Dome in Maryland, Lagos. The plush red carpet event will have on stage Nigeria's most celebrated gospel singers and some of the most respected ministers of the gospel in the country. Among the many stars expected to thrill the audience are reggae gospel crooner, Buchi; the sweet singing star, Chidinma; Prince of the Delta, Asu Ekiye; Sonorous voiced Frank Edwards and Princess of the Gospel, Ann Inyang. Several pastors and bishops have confirmed their participation at the great show which will be anchored by Victor Oladokun who is very famous around the world for his exceptional presentation of great Christian programmes like 'Turning Point'. Red carpet and cocktails begin at 3.00pm. This event is strictly by invitation.